More than 100 residents gathered at a meeting to discuss plans to dual the A27. Selmeston Village Hall was packed to the rafters on Tuesday (June 12) with people concerned or curious about what proposals by the A27 Reference Group could mean. Some campaigners argued the proposed ‘motorway-style’ road would conflict with Government promises to protect the environment. Victor Ient was among those who said misunderstandings had arisen over the issue. He said, “I showed the audience the outline corridor map which indicates routes potentially going through villages like Glynde, Beddingham, Firle, Chalvington, Ripe, Berwick, Selmeston, Arlington and Long Man. “Many people also told me they were confused after receiving that letter from Maria Caulfield. It’s therefore really evident that the public have just not been made fully aware of what is being discussed and proposed by the Government. “When I attended the second Highways England Stakeholder workshop on the May 3, I was astonished to learn not only was it the second and final meeting, but local parish councils had not even been invited. Oliver Harwood, the land agent for The Folkington Estate added, “I was delighted with how many people attended our meeting – and clearly, many felt they had been left out of the authorities’ considerations. “I explained not only the impact on the countryside and hugely important biodiversity with evidence from our client’s historic landscape consultants and the Sussex wildlife trust, but also detailed the impact of the proposed new road on local people and property. “It remains the case that the Land Compensation Act does nothing to compensate householders for the wider impact of a new road on their landscape, their community or their property values. Maria Caulfield, MP for Lewes and Polegate and Chair of the A27 Reference Group, was unable to attend the meeting as she was in Parliament voting on the EU Withdrawal Bill. Speaking to this newspaper, she said, “I have written to residents along the A27 corridor to reassure them that the false maps of possible routes for A27 improvements, being circulated, are just that. False. “The A27 reference group has submitted a business case for £450 million for the A27 and once funding has been agreed, a series of public meetings will be held for residents who will be front and centre in agreeing any route decisions that need to be taken. “It is disappointing that those who are against any improvements to the busy and dangerous A27 are choosing to frighten residents with fake news. This comes after a bid was announced earlier this year for a £450 million government-funded scheme to dual the A27. 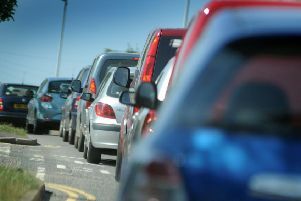 The business case, which is to be presented before Government Ministers by the A27 Reference Group, is looking to gain the multi-million investment for a dual carriageway between the Southerham Roundabout in Lewes and Polegate. It is hoped this will reduce journey times and improve safety on the road. Read more about the scheme here and read more about residents’ concerns here.